Well, it’s the end of another year, and I thought I’d come along here to ramble for a bit about my hobby successes during the course of the year. You know you love it! 2017 has been really quite remarkable in a number of ways. Despite the inherent problems when moving house, I have managed to paint up an entire Dark Eldar army that currently numbers something like 2000 points, as well as building and painting a variety of Imperium stuff, including the beginnings of my AdMech/Tempestus Scions army. So let’s sit back and take a look at some of my hobby highlights! First of all, let’s talk about Necrons. My very first army, I started the year determined to re-do most of my miniatures, as I’d been feeling that I could do a much better job with them. Then over the summer I decided that no, I would actually build a whole new Necron army with a different paint scheme, and went for the Thokt Dynasty and its cool blue weaponry. To date, I’ve only got five Immortals (above) and five Lychguard painted in this scheme, so I do have quite a ways to go with them! But I have plenty of kits for the army just waiting in the wings, so I should be able to do something with them in the new year. The army is one that I’m really excited for, however, so I’m looking forward to properly getting to grips with them all. A platoon of Scions working alongside waves of cyborgs and their various battle automata should look really good on the tabletop, I’m thinking! I went for some wildly different paint schemes for these chaps, and have somehow managed to basically invert the usual schemes for each, having my Scions red and my Skitarii blue… At any rate, I’m pleased with the guys that I’ve painted so far, and I’m looking forward to getting more of them painted so that I can start having games with them! 2017 will forever go down in the annals as the year of the Dark Eldar, however. After a short period of casting about for something new to really get my teeth into, I knew from building my very first Kabalite Warrior (that guy with the agoniser, above, in case you were interested), this was going to be an army I would enjoy building and painting. 2017 has also seen me play more games of 40k than ever before, and the majority of those have been with the dark kin. While they are still somewhat new to me, of course, I have never enjoyed playing this game so much as I have when commanding the Haemonculus Covens and the Kabalite Warriors of my collection. There isn’t really a lot more that I could say, if I’m honest. Dark Eldar are, for me, my favourite army, and I’ve loved getting them all built and painted, and then playing games with them since the release of 8th Edition. They’re an amazing force, and I’ve got no plans to stop adding to the ranks anytime soon! However, I’d also like to look forwards in this blog, and see what I’d like to accomplish in 2018. These things never go according to plan, of course, but I think it’s good all the same to get some idea of where I’d like to be headed as the new year begins! If you follow my on instagram, you’re not only a very discerning individual, but you’ll also no doubt be aware that I’ve spent some time building up quite a sizable Tyranid force already. This has developed out of a desire to have a small detachment of big bugs alongside my nascent Genestealer Cult, which has seen barely any work go into it over 2017 – at the most, I’ve managed to get three miniatures painted for them! In 2018, therefore, I’m planning to get this off the ground in style. I’ve talked somewhat already about my desire to have this kind of force, with Cultists forming a central point around which is built an army including elements of Guard and Tyranids, so I’m hoping that I can very much get this going in the new year! I’m going to start with the Tyranids properly, and may even do a sort of Tale of Four Warlords-style series for it, so we’ll see how that goes! Alongside this, I want to keep playing my Dark Eldar, and have been planning to start adding Wych Cult units with gusto. I’m also going to get myself a Tantalus in March, so that will be cool! 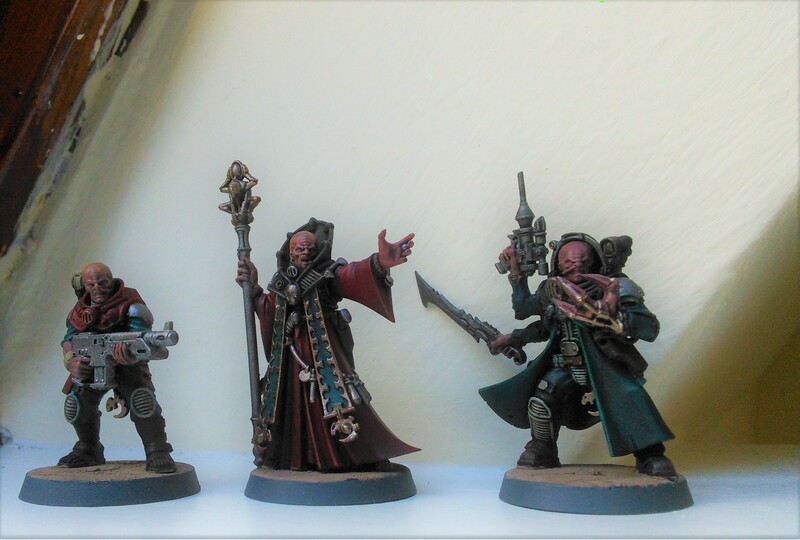 In addition to this, I want to continue to tinker away with the AdMech/Scions list, and see how far I can get with that – probably going to start small and build up. For some light relief, I’m also planning to throw the odd Necron squad in there as well, as I continue to build up my new dynasty. The rumour mill seems to be pointing to Necrons as being one of the next codices after Daemons, so I may find myself with the impetus to finally get going there! I’m really looking forward to 2018 in terms of the hobby, as I’m feeling like GW are going to be doing some amazing things, and I can’t wait to see what’s coming!! Previous Previous post: Another Drukhari catch-up! Next Next post: Cities in Ruin!